I read once that long before her name was a brand, Donna Karan couldn’t find a pair of slacks that she needed. She’d looked everywhere, and certainly there were plenty of pants to be found, but none of them satisfied her. So she designed them. And her eponymous empire was born. I have no idea whether or not that story is true, but I’ve decided that it doesn’t really matter. I love it, and whether or not its details are accurate, I find it to be a lovely modern fable. If you need it, and you can’t find it, create it. I’ve mentioned before that I am desperately overwhelmed by April. By all of the in-your-face autism awareness campaigns and endless talk of our children as though their very existence is a scourge on humanity. It’s too much. As I said in a recent post, the whole thing – advocacy, positivity, hope for change – it all just starts to feel futile in the face of so much, well, much. But activism isn’t something that we do for sport. It’s not a hobby to keep our hands occupied while we watch television on a Saturday night. We don’t get to walk away from it. So I’ve got to find a way to wade through the muck of April without diving into the rabbit hole. My strategy is to focus on the Donna Karans of our world – the ones who see a need and find a way to fill it. There’s always something that we need. And here in autism land, it’s usually a hell of a lot more than a pair of stylish trousers (though don’t get me wrong, a good straight-leg slack with the right heel can add a solid optical six inches and who am I to scoff at that?). We need services that don’t exist. We need community and meeting places and comfortable, safe spaces. We need opportunities for our children to relax and play and join in. We need places where they can connect with their peers. Places without judgement. Some of us lament what we don’t have. Others use what they have, scrounge for what they don’t, and go out and design the damned pants themselves. Three and a half years ago, Shannon approached a USTA teammate named Chris O’Connor, who was running summer camps at a facility in their Connecticut town at the time. They talked about the therapeutic potential of tennis, and the lack of opportunities for kids like ours to play. The Well Served Tennis Academy was founded in 2010 and welcomed its first campers in the summer of 2011. They have welcomed approximately 15 kids every summer since. A typical day at camp involves tennis drills led by a pro, a social activity led by a behaviorally trained therapist, a camp cheer and lunch. Just for fun, they also welcome members of the community to join as special guests. The kids have met with the local fire fighters and had lunch with their town police. 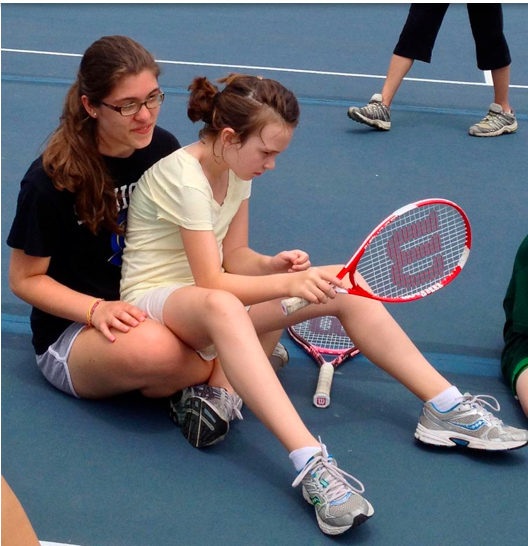 Each camper is paired with a peer coach, most often a local high school or college tennis player, all of whom have completed a training course with the therapist. It’s that kind of thinking that invigorates me. That makes me think that all of the wrangling in the muck and all the grumbling over which words we use to describe Autism Awareness or Action or Acceptance or Abracadabra Month can’t stop change from the ground up. Because you see, the truth is, this is where it all starts. In small towns all over the world. With people like Shannon, who have a passion for something and a mission to make it accessible to others. And the will to make it happen again and again and again. And perhaps, even without realizing it, Shannon and Chris are also proving to all of us that if we have a dream for our kids and the will to make it happen, anything is possible indeed. 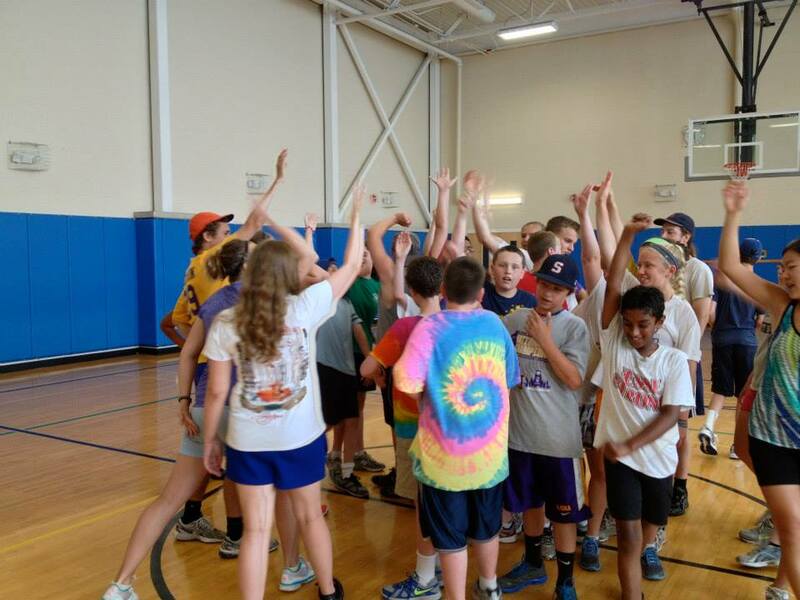 Image is a photo of the campers doing their camp cheer. Used with permission. Click HERE to support WSTA. Great way to start the day. Thank you for sharing this. Thank you to all the Shannons of this world. Thank you Shannon for this and all you do for and with our community. This is very cool. Even cooler is the fact that they are located in one town away from where my family lives, so it might be an option for us for vacations for when my son gets older ;). Thanks for sharing this. What an awesome and inspirational story. Way to go Shannon! Very well spoken hope and an excellent theme and commentary on a modern day fable about making things happen that speaks true to me and so many other autistics and others. I myself find I can make pretty much anything I want for my college dorm with simple things like bottle caps, snack wrappers, receipts, and Altoids tins (coasters, windchimes, wall fish, pictures, Zen gardens), and it’s greatly motivated me in helping the autism world. I liked the passage of how things start in a small town and autistic people and their loved ones needing places with out judgment as I am trying to start a social network/mutual aid society for autistic students and residents and their loved ones in the small town of Warrensburg where I attend school as an undergraduate majoring in Cultural Studies, and we are starting small but gradually growing, and I started a similar group while at a local community college in my hometown of Greater Kansas City. I wish you well on your dreams for your daughter to thrive as a proud autistic woman and making the world know the true world of autism.